After the successful launches of ‘Koxttantlean Mhoji Kola’ (DVD/ACD), ‘Jezucho Mog Ek Vizmit’ (audio devotional), ‘Mummy-nk Daddy-k Ek Mogachi Bhett’ (DVD/ACD) and ‘Mhozo Heart Beat’ (audio CD), Chinchinim-based Bryan Fernandes is all set to win the Goan audience with his new DVD release ‘Sopon Zalem Purem’, under the banner of Sunshine Production. The DVD will be released today, November 9, 2018 at the hands of Fr Conceicao D’Silva at Our Lady of Snows Church, Raia. Indian pop singer Usha Uthup, who has rendered her powerful voice in 20 different languages, will feature in DVD ‘Sopon Zalem Purem’. Usha Uthup is a Bollywood playback singer with a singing career that spans decades; she also performs at an international level all around the world. In order to take Konkani at greater heights, Bryan Fernandes decided to rope in the legendary singer and provide the audience with something different. “We at Sunshine Production along with the Musiclix Boys wanted to take Konkani music to a different level and hence though of making something different, repeating history, after 49 years,” states Bryan. 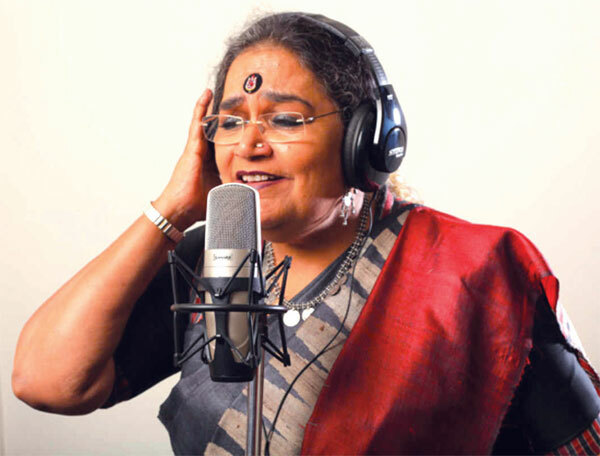 “Usha Uthup first sang in Konkani for two albums of Chris Perry in 1969 and now, after a gap of 49 years, we wanted someone who not only would sing in Konkani, but who has the passion and love for our Konkani music. We approached her and she was happy to be a part of the project,” reveals the director. “She loved the lyrics and the music very much and gave us a positive nod. The track she renders is ‘Orrad Festam’ and the lyrics are based on Carnival and Sao Joao festivals,” he adds. The second song that Usha Uthup is part of is ‘Goem…Daiz Goemkaranchem’, where there are 14 singers and the Bollywood singer has rendered the chorus herself. There are altogether 10 songs in the DVD and 11 tracks in the ACD. The lyrics are penned by Bryan Fernandes, with music by Elick Vaz, cinematography by Patson Barbosa, recorded by Aurvile and Condrad Rodrigues (audio masters), mixing and mastering has been done by Velroy Fernandes (Veltuned Studio), with Hugo Moraes as the production co-ordinator. The producers include Santano Fernandes, Agnelo Vaz and Zelton Lacerda. “These three seamen had a dream to take Konkani music to a higher level and hence they approached me one day. I loved their idea and passion for Konkani music and I agreed to work with them in collaboration under Sunshine Production. I hope I have done justice to the producers’ expectation, hopes and dreams,” says Bryan. “Besides passion and love for our Konkani language, their willingness, thoughts and the desire to help the needy were other qualities that I appreciated in these three boys. “They said that they not only want to do something for the love of Konkani music, but would also like to help the boys at Fr Agnel Niketan, Pilar,” he reveals. Artistes in the DVD include (singers) Usha Uthup, Nephie Rod, Bushka D’Souza, Lawry Travasso, Elvis Mascarenhas, Bryan Fernandes, Aurville Rodrigues, Scully D’Souza, Annapurna sakardande,Rajesh Madganvkar, Velroy Fernandes, Larissa Fernandes, Elick Vaz, Judy Fernandes, Tony Lacerda, Dafina D’Souza and Agnelo Vaz. Among the artistes are Elvis Mascarenhas, Tony Lacerda, Cecille Rodgigues, AurvilleRodrigues, Anette Mascarenhas, Usha Uthup, Scully D’souza, Jim Reeves, Lawry Travasso, Bushka D’Souza, Dagley Fernandes, Blossom Rebello, Benzer Fernandes, Nephie Rod, Larissa Fernandes, Judy Fernandes, Elick Vaz, Hugo Moraes, Rajesh Madganvkar, Patson Barbosa and supporting cast.